I've been reading this book for 16 weeks! I'm a sloooooow reader. And it's a long book. At 220,000 words it's longer than any book I've written and almost three times as long as Prince of Thorns! Still, it's only half a George Martin doorstop. But mostly, I had an electronic copy and I don't get on with reading from my laptop - I keep nipping off to the internet! So - to the book. First off, it's really well written. Anthony Ryan can write! In fact he's annoyingly good. There are three point-of-view characters and the story is split reasonably evenly between them. The main pillars of the book are world-building and story. The magic comes in through gaining powers from drinking the blood of dragons (drakes) - exactly the same as in an unpublished book I wrote in 2001, down to the colours and the fact that a very tiny percentage of people can survive drinking the blood. The implementation though bears no resemblance to mine and the setting is a refreshingly different with late 19th century(ish) technology and a vast commercial empire where profit and trade have replaced royalty or democracy. The presence of the drakes and the need to harvest them make for an unusual kind of Victoriana. Plus there's a largely unexplored continent where the drakes are hunted and on which a lost explorer is sought (Dr Livingston, I presume?). Our characters are a secret operative in the corporate wars, a thief with special talents, co-opted to explore the wilds in search of a unique drake, and a naval officer serving on an ironclad warship. I loved the naval battles and the life aboard ship stuff. The covert operations were great fun too. And the out in the wilds with the drakes and the natives element was also fascinating. In this last thread we have a wild-west element with gunmen (and women) aplenty. It's a marvelous piece of imagination with plenty of twists and reveals to keep it going. Any complaints or doubts? Not on my own behalf. I will say though that the spectacular success of Ryan's debut, Blood Song, was in part due to the focus on a single, young, heroic character. Many fantasy readers like a 'cool' sword swinging hero and they got that in spades in Ryan's first book. Some readers were disappointed by the move to multiple characters in the rest of that trilogy (that I must read!). In The Waking Fire although our secret agent has plenty of smooth moves there really isn't a 'wow' character to appeal to the demographic that love a blood and guts hero. 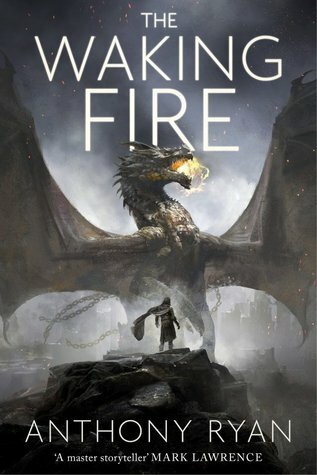 This is a more sophisticated story - although don't worry, plenty of people get shot in the head and the Gatling guns vs winged fire-breathing dragons are very cool (& put me in mind of Myke Cole's Black Hawks vs dragons in the Shadow Ops books). In short then, it's a great read with tons of twisty story and excellent world-building. You can go and 'like' my review on goodreads, if you like. An index of my reviews. In terms of e-reading, a Kindle/Nook/etc... is often much better than an actual computer. The traditional formatting and the ability to highlight/mark up with a finger is handy. Competition, photos, prizes, oh my! The SPFBO now has an award! SPFBO 2017 - A call to authors. SPFBO 3 - blogger line up! Blogger call for SPFBO 3.